One day in the early 1990s I brashly decided to try to write a biography of Elder Bruce R. McConkie myself—besides figuring it to be an enjoyable enterprise, his was a name that I thought would open doors for me that would otherwise remain closed to a new obscure author. However, from hindsight, I confess that if I had that particular decision to make over again, after having endured what I did to produce the published book, I would not do it. I did not know then that I had chosen about the most difficult and troublesome subject I could have. But I can be a tenacious fellow and am not easily discouraged from doing what I put my mind to. So I moved ahead with determination and naïveté. I first reviewed my own files and found that I had already assembled a surprising amount of material by or about Elder McConkie; that seemed a promising start. Then I thought it prudent to check with the two most prominent LDS publishers at the time, Deseret Book and Bookcraft, to learn whether anyone was currently writing a biography of Elder McConkie. I did not want to spend years researching and writing only to have someone else beat me to the shelves. In talking with acquisitions editors at both publishers, I learned that nothing was in the works, but they both warned me that Bruce’s sons would have something to say about my idea. Being innocently foolish I brushed that concern aside and forged ahead. It was the beginning of a long harrowing journey fraught with “learning” experiences. I did not know and could not have known how private and protective of their father some of Bruce’s children, and one particular general authority, could be. I launched into my research with zeal. I gradually obtained copies of every public article ever written about Elder McConkie and his wife and family and parents. I obtained copies of anything and everything (in print) he had said or that others had said about him, including his critics (all in the days before the internet). I accumulated a sizeable box of files in the form of articles, talks, newspaper stories, notes, interviews, and so forth, and organized it all. I then put together a tentative table of contents and sent it and a request for assistance to Joseph Fielding McConkie, a son of Elder McConkie and a BYU religious educator whom I had taken a class from some years before. When a couple of weeks passed without a response, I called Brother McConkie at his office at BYU. I asked if he had received my letter. He answered that he had and asked if I had received his reply letter. I answered that I had not. Then he grilled me for most of an hour, making me justify everything in the proposal that I had sent him—basically wanting to know if I had done my homework but especially wondering why I had included a couple of the controversial items that I had. Then he took me through a list of reasons why a biography should not be written about his father, the main one being that his father had requested that one not be written. Lastly he warned me that the letter he had sent me contained some of what he termed “sting.” When I got home that day I found his letter awaiting me. It did indeed contain a generous portion of “sting.” (I have always considered it fortunate that I was able to talk to him before reading his letter.) Some of it was because he objected to my listing Eugene England and a letter that his father had written to him as a research item and it had upset him some. (This issue later became part of the “Epilogue” in the 2010 second edition. Joseph was not a fan of England.) He also indicated the McConkies were well-educated and scholarly people, capable of writing their own biography (which they hadn’t and seemingly wouldn’t) if they so desired. It was quite a stinging punch in the gut, but from his perspective I just can’t judge him harshly for it. Yet, being undaunted and zealous, and having already written much of the book in my head, I waited a while and then called Joseph again and after some discussion obtained permission from him to write the biography, but without any assurance of help. When finished he would review it and decide if anything could be done with the manuscript—but he gave me no assurances or guarantees. One helpful source I had located was an article, published shortly after Elder McConkie’s death, written by Sheri Dew (then vice-president of Deseret Book). I realized that she must have recorded conversations with family members. I therefore got Joseph McConkie’s permission to ask her to borrow the tape recordings for my own purposes and called her. She said she would not let me use them without family permission and when I insisted that I had it, she said she would check with Joseph to verify my story. She did not do so and when I called her back she refused my request. Despite these early setbacks that I encountered, I remained undaunted and determined. I interviewed a few people (including Elder John K. Carmack), did further research, and lots of writing. In reply to my letter asking if I could interview him, Elder Carmack wrote (March 1997): “What a fascinating subject. Elder Bruce R. McConkie. He was unique and wonderful. When he toured my mission he changed the environment drastically into one in which we really studied and pondered the meaning of the gospel and taught with greater power. Sometime if you would like to talk I can share a few stories of that and other experiences. . . . You do have a fascinating subject to research and ponder. May you be blessed with inspiration and the gifts of the Spirit. If I can help in a way I am authorized to do let me know.” My interview with him was a sweet experience; it didn’t take him long to see what an admirer I was of Elder McConkie. Elder Carmack also thought a great deal of Bruce’s father Oscar W. McConkie, a marvelous spiritual giant. Even Joseph McConkie helped me a few times. In reply to an inquiry I sent him, I received a letter dated March 25, 1997, containing some information about when Bruce’s mother passed away. I soon thereafter completed a first (non-professionally-edited) draft. I mailed that draft to Joseph around early 1998. He in turn passed it around to family and then replied by letter, stating a number of reasons that the manuscript should not be published. Having reviewed this February 23, 1998 letter again, I find that some of it is still too sensitive to divulge. However, parts are quotable: “We appreciate your interest in and respect for our father and his doctrinal contribution. The concerns raised by the family relative to the publication of such a manuscript are essentially those I explained to you when we first spoke plus a few new wrinkles. Prior to my father’s death he gave me the responsibility of caring for his writings and papers. The First Presidency assigned two members of the Quorum of the Twelve to act as my advisors. We have met as necessary to give direction to such matters. I have been contacted by the senior member of that committee [Elder Packer] who has reviewed your manuscript. He has expressed serious concerns about it.” My understanding is that those concerns had to do with narrations of events regarding Bruce’s interactions with certain individuals, such as Eugene England and George Pace (a very fine and wonderful man who became my friend years later), and my extensive review of the Mormon Doctrine episode—all of which material was drastically edited for the first edition of the book, but some of which is included in expanded form in the second edition. Joseph also indicated, if I may rephrase the gist of what he wrote, that his mother, Amelia, was caught off guard by seeing herself so prominently mentioned in a manuscript about her husband written by a complete stranger. In her mind, even though I was only using public sources, I was invading her privacy. Joseph then said: “The feeling of the family is that if such things are to be written they should be written by a member of the family, or by the family collectively, but not by someone else. That represents my feeling also. You have done well with the material available to you. It is hard, however, for a member of the family to read it and not be aware of a wealth of material that has not been used.” He then referred to the Mormon Doctrine chapter and Eugene England letter section as making the family uncomfortable. Of course, this all comes down to a judgment call for a historian/author—what do you include and what do you leave out? How do you approach such sensitive items in the lives of great Church leaders? The Church’s enemies dredge up controversy to exploit it and try to do damage—an approach neither helpful nor ethical nor honest. My training was to tell the story as the available evidence portrayed it. Joseph explained that “To publish such things would add nothing to anyone’s faith, rather it would be hurtful to some.” He concluded with “I would ask you not to seek to have the work published. Everyone that I have counseled with joins me in that request.” He was slamming the door with a resounding bang and doing all he could to convince me to drop the entire matter. One could also debate whether the purpose of biography is to tell a life story and narrate a person’s history—or—to teach gospel principles. I don’t care for either extreme; to me the best LDS biography does both in appropriate measure. I have your letter in which you say you are thinking of proceeding with the manuscript on the life of Bruce R. McConkie. . . .
You might be well advised to give careful thought before going to a great deal of work to revise the manuscript. You indicated that you are not aware of the challenges of publishing. Let me suggest that preparing the manuscript is only a part, perhaps even a small part of the problem. You must have a publisher who is willing to publish it. The cost of publishing manuscripts runs into the many thousands of dollars and publishers usually will not proceed unless they are certain about the salability of the book. Unless you have a publisher, or can fund the project and distribution yourself, you might be very cautious. I would recommend that you follow carefully the feelings of the McConkie family. Elder Packer also phoned Joseph and told him to tell me not to publish it. So one evening I got a call from Joseph, again going over the same reasons not to publish the manuscript, but hinting that he was acting at someone else’s direction. I eventually got him to uncomfortably admit just enough that I knew what had happened, but I was given no definite explanation for why Elder Packer would not want my manuscript published. I do not know if he read the copy I had sent him in part or in whole; I got conflicting reports on that question. At this point, in meeting such resistance, I brought up the question of whether or not the manuscript could be published either in whole or in pieces as articles someplace. Joseph replied: “I certainly have no objection to your using any of the material you have compiled in papers for history symposiums, in the form of articles for responsible journals, the Ensign, BYU Studies, etc.” He then kindly offered to bring up the question of publication with his siblings and mother at a family reunion (where of course, I would not be present). He said: “I would be glad to talk to them about that kind of thing. We are having a family reunion during the middle of July  at which each family should be in attendance. We have an agenda of family business to attend to and I could present the idea for discussion at that time and then report their feelings to you.” I foolishly became hopeful and excited. He soon reported back (July 20, 1998): “The Bruce McConkie family met to give consideration to the publication of your manuscript. After considerable discussion it is the united feeling of the family that the book not be published. Given that a number of us have had experiences in the publishing field we are keenly aware of the time and labor involved in the preparation of a manuscript like yours. We recognize what you have done as a labor of love and hope that the labor will prove to be its own reward.” He finished by noting: “It may be helpful for you to know that it has been suggested to us as a family that we not add to what is presently in print as far as Dad’s teachings are concerned.” Then to conclude: “Thank you for your sensitivity to our feelings.” I kept wrenching the door back open and he kept slamming it shut again. Further, whatever had been said to the family by whomever, in relation to publishing brief excerpts of Bruce’s teachings, had not been said to me. From hindsight I can understand their collective reaction. Here was a stranger, of unknown motivation and purpose, sticking his nose way way up into their business; a disconcerting and unwanted intrusion of privacy to them. The book was in early draft and read somewhat amateurishly. I had brought up some uncomfortable episodes. They were also intensely protective of their parents, even though Bruce was a very public figure for over forty years. The slander and hateful criticism from many of their father’s critics had caused them to become understandably defensive and cautious. Finally, it must also be acknowledged that royalties were at stake. At least these are my best guesses for why they reacted as they did. I don’t remember the date, but sometime around these perplexing setbacks, I was feeling increasingly desperate. I had done so much work; spent so many hours over several years; put all my heart and mind into that manuscript. So I asked a friend of mine to call a friend of Joseph’s and see if anything could be done, which he did. Within a little while Joseph himself had called my friend and given him the same laundry list of objections to the book being published that he had given me: parts of Bruce’s life, he said, were either too sacred, too controversial, too awkward, etc. And I was again given the explanation that Bruce had asked his family not to write a history of his life and they expected me to honor that request. For my part, as highly as I thought of Elder McConkie, in this particular instance I thought him dead wrong; his life story deserved, even begged, to be told. Yet I had, albeit in a roundabout way, received counsel from an apostle that I admired and respected as few other people on earth, not to proceed with publication. That knowledge put me in a terrible quandary that I sometimes reflect on to this day. One of these fine Institute men (now long retired) had also, with my permission, passed along the manuscript to his director (also now long retired), who read it and wanted to visit. I soon found myself spending a half-hour talking over the situation with him. He was more knowledgeable about the intricacies and difficulties that are sometimes present in LDS publishing. I reviewed with him what I had done and received something of a blunt but kind critique of my mistakes. His frank feedback is still too sensitive to mention, but he wished me success in my efforts. Some will think me a fool, as I sometimes do myself, but because of how much work I had done on the project, how strongly I felt about it, and how many obstacles I had overcome to that point, I decided to move forward and try to have the manuscript published. This despite knowing that Elder Packer had sought to influence its demise from behind the scenes, but also because I had removed the offending controversial content. I also paid a wise and experienced editor to copyedit it for me and learned much from his work and counsel. I submitted it to both Bookcraft and Deseret Book, but even with such an extraordinary “angle”—the life of Elder Bruce R. McConkie—meant to open their doors, I was stymied. They both expressed great interest at first, but after contacting Joseph McConkie, who told them not to publish it, they would not. I remember that when Cory Maxwell, then Acquisitions Editor for Bookcraft called me to inform me they had rejected it, I got a little upset with him and did a little uncharacteristic barking. It was in talking with him that I gathered that he had contacted Joseph and had been told not to publish it. I have always felt bad about getting after Cory; he was stuck in the middle and couldn’t help it. I had fought so hard to write the book and was now discovering, as Elder Packer had noted, that the writing itself was really the easy part. I next sent it to Covenant Communications, then the third largest LDS publisher (no longer), but when they learned that I did not have family support, they turned it down. It seems that my planned strategic “angle” was yanking doors open and then slamming them shut with equal vigor. I next tried Aspen Books (now long-since shut down) and received initial enthusiasm from James Asay (now deceased), who was over new publications. Then, yet again, when he learned I did not have family support, he lost interest, explaining that being the son of a general authority himself (Elder Carlos Asay), he felt sympathy for Bruce’s children’s perspective. Now finding myself in the most desperate position I had yet been in, I again called Joseph McConkie and was able to work out a deal with him that if I could get his mother’s consent to seek publication without her endorsement, approval, or objection, I could proceed with publication under those circumstances. So one day during my lunch hour I walked to her apartment complex thinking to leave the manuscript and a note with a receptionist or at a security booth. Instead I found a tiny entryway with a phone and a resident directory. This meant I had to call Amelia myself to arrange to drop off the manuscript, something totally unexpected that I had not come mentally or emotionally prepared to do. I knew that she had been a little upset by the surprise of seeing herself written about in its pages some time before. I stood there in front of that phone and sweat bullets for what must have been five or ten minutes, debating what to do. I felt as though I was trying to gain enough faith to move mountains, or in this case, open a tightly locked door. I knew the entire project, with all my hard work and foolhardy perseverance to that point would be wasted if I did not try. I finally steeled myself, called Amelia, and she invited me up to her apartment. I had a very pleasant visit with her and she told me some stories about Bruce that I had never heard but was delighted to hear. I told her that I was not asking for her endorsement or approval, but simply her permission or consent to proceed with publishing on my own. I left the book with her for a week or two and then returned for her answer. We again visited for a while. She said she would never stand in the way of my publishing my own book. As I was leaving, she took me by the arm and said something to the effect that she was sorry. This confused me a great deal and left me wondering exactly what she meant. On meeting her I had concluded that she would likely not understand the need for written permission so I had not asked for it. To me she seemed mentally sharp and alert enough to grasp what I was asking for. But her concluding comment perplexed me then and has ever since. I felt I had verbal permission, but was not fully confident about it. During this time I happened to run into Elder Gerald Lund, a general authority that had written many very popular volumes of historical fiction. I took occasion to ask him for a little advice about publisher-author contracts (a complicated part of the business). He asked who the subject of the book was, and when I told him even his stoic face registered surprise. He had exactly the same reaction everyone else did that I told about the book—shock that I had done it. I started to call such reactions “the McConkie jump” because they were so common. While things were falling apart with Aspen Books, I happened to drive past Eborn Books, a used and rare bookstore that I had visited a decade before but that had moved to a new location. I stopped in and checked the place out. Without explaining why, I casually questioned the owner, Bret Eborn, about whether he was interested in becoming a “new” book publisher and what he thought about Elder McConkie—I was not going to work with anyone who did not think highly of him. Bret gave all the right answers: he was just then trying to expand the publishing arm of his business (he had reprinted a number of old public-domain Mormon books and pamphlets already) and he was a fan of Elder McConkie. I had finally found a promising publisher! Within a few days I returned with my manuscript, then in third draft form. He read it and loved it and was interested in publishing it; he thought it would be a great “new book” launch project for his company. Aspen Books told me to tear up our contract since they were falling apart, and I signed with Eborn. This began a mutually satisfactory business relationship and personal friendship. Eborn Books hired a fantastic editor that polished up the final draft and taught me a great deal about editing and publishing. But crazy and frustrating incidents continued: one day while standing beside a countertop in Eborn’s store, I was bending over, closely inspecting some galley proofs of the biography. All of a sudden my head was hit hard by something heavy. I was not knocked out, but was stunned and it took a few minutes for me to come to my senses. A large florescent light fixture in the ceiling had chosen that moment to come completely loose at one end and had dropped like a hammer onto my head. I had slightly moved right before it hit or the sharp metal edge would have scalped or perhaps even killed me. But as it was Bret Eborn found me standing in front of his store counter in a daze, wondering what had happened and why there was a mess all over his counter—a broken light fixture, bits of ceiling tile, plastic, maybe some of my hair, etc., everywhere. It was another of a long line of exasperating hurdles and hindrances I had by then come to expect but fear. It was near that time that I needed to obtain a variety of photographs of Elder McConkie. I visited the Deseret News and the LDS Church Archives and was able to obtain many fine pictures. I got the front dust-jacket cover photograph (and a few others) from Brit McConkie, one of Bruce’s brothers that was a special friend and mentor. The Church archives and copyright office gave me copies of photos of Bruce and copyright permission to use them. In discussing the project with one of their employees, I was told that the archives had called Amelia and she had given them permission to use pictures of Elder McConkie in their possession; I therefore thanked her for doing so in my Acknowledgements. I later found out that to be in error through some misunderstanding. However, I did obtain standard written copyright permission for using the photos I selected from their archive. When Bruce’s oldest daughter read the sentence in the Introduction with my thanks to Amelia for copyright permission for photos in the book, she became upset and called Elder Packer. He in turn called the archives and asked for a history of their dealings with me, that he received and in turn gave to the daughter (or so I was told). The manager (now long retired) of the church copyrights office (now called the Intellectual Property Office) and the supervisor of the photograph archive huddled in a meeting and called me wondering why in the world Elder Packer was involving himself. I explained everything I knew and told them I had written a letter explaining details to both Elder Packer and Joseph McConkie. That seemed to relieve them. The archive supervisor (now retired) couldn’t remember having said anything about Amelia giving permission to use photos of her husband and it wouldn’t have been archive policy to ask her anyway. The daughter was able to talk Amelia into writing a letter (or wrote it herself), that was mailed to Eborn Books via a law firm, saying she had not endorsed the book and we were not to use her name to promote it. I was puzzled because we had never said that she had endorsed it, but as usual, misunderstanding and confusion prevailed and I was dodging more difficulties. I was always grateful that Bret Eborn, owner of Eborn Books, weathered those tough times with me. The book finally went to the printer and bindery. Because of frustrating delays, we did not receive the finished book until the night before the LDS Bookseller’s Convention in August of 2000, where it was announced and successfully launched. It had finally happened: after all the setbacks and roadblocks and obstacles and problems, the book’s subject or “angle” finally helped open doors for it and Eborn Books received many orders from retail establishments. I remember having to find it for a customer in the old ZCMI downtown Salt Lake Deseret Book, when the clerk had no clue where or what is was. That Christmas their website showed that despite their poor ordering and placement of it, for a time it was still their third best seller previous to Christmas. People were buying it, reading it, and loving it. I never could understand Deseret Book’s initial treatment of it (they do better by it now). I also remember that a supervisor at the University Mall Deseret Book location in Orem, Utah, thought his company book-buyers were moving much too slowly with it and so he took it upon himself to order a nice quantity directly from Eborn Books, bypassing regular channels. That location sold out within a month, but the employee’s decision contributed to the loss of his job. Seagull Book and Tape (a larger chain then; now long owned and downsized by Deseret Book) was another confounding perplexity. Their book buyer at the time was a young woman not yet very well versed in her craft. After telling Eborn Books “no” a couple of times she finally asked “Who is McConkie?” They were perplexed that the head book-buyer for the second largest LDS bookseller didn’t even know who he was. They pressed them to carry it and one day, after asking several times, she snapped and said “I told you no!” But enough people were asking for it at the Seagull bookstores that apparently managers were asking their corporate headquarters how they could get the book. With this pressure, the buyer finally called them and said “okay”—but she didn't want to order them the normal way. She said she was going to let each store manager order their own and rather than have Eborn Books ship them all to their warehouse for distribution, she would have them mail each order directly to the stores. The managers all ordered many copies at that point. It seems customers that loved Mormon biography or Elder McConkie didn’t know or care a fig about politics; they just wanted to read the book. But problems were not yet all behind me. At the Bookseller’s Convention, I started hearing many rumors from people that Elder Packer had stormed over to the archives and yelled at the employees for helping me get pictures of Bruce; it was almost the talk of the convention that year. I discovered that the main source of the rumors was the liberal, semi-dissident, publisher of biased “Mormon” history that manned a booth at the Convention. I investigated and found this rumor to be largely false. It was when I tracked the rumors down that I learned about Brother Packer calling the archives and asking for a history of their dealings with me in response to the daughter’s telephone inquiry—it may well have been a vigorous, emphatic-sounding inquiry. I was present when a telephone conversation took place between the manager of the Church Copyright Office and a senior (now deceased) employee in the Church Historical Department, discussing what to do about the situation. It was decided they do nothing and leave any outstanding matters to be resolved between me and the McConkies. Sometime later, I heard a second-hand report about a McConkie family meeting in which me and my recently published book were criticized by Bruce’s children, but at which one of Bruce’s brothers, whom I had only met once many years before, had stood and defended the book. He had told the kids they were late to the game and that I had filled the vacuum and written a good book about their father. I hope my retelling by memory of what I heard of this event is accurate. My publisher, Bret Eborn, had an email forwarded to him from an extended McConkie relative, in which Bruce’s eldest daughter mildly criticized me and the biography—not in a spiteful way, but in an uninformed condescending way (we have never met). At the time the book was published I was working for the Church in a position that required me to visit the Church Administration Building, where the First Presidency and Twelve Apostles and their secretaries have their offices, almost every day. I had a good and kind friend (now retired) who then worked as the Secretary to the Twelve. He and I decided it would be prudent for me to give him a copy of the biography so that he could pull it out and explain it to the Twelve—if it was ever brought up or discussed by their Quorum. Since I was employed to do other things besides deliver my book to the Secretary to the Twelve, and since I was a little nervous about how one of the senior Brethren might react to my walking around with it, I put it on a cart underneath a white plastic bag holding office supplies and headed for the Administration Building. As I entered the security room on the first lower level, I encountered Elder David B. Haight, who stopped at the cart, looked directly into the bag of office supplies (causing my heart to skip a beat) and said, “Oh look, goodies!” I then had to explain that they were only office supplies. He smiled and walked off. I pulled myself together and proceeded to the elevator. When it opened, President James E. Faust stepped out, saw the bag on top of my book on the cart, looked at it and said, “Oh look, goodies!” I then said to him the same thing I had said to Elder Haight, and my heart skipped another beat. I was rattled but relieved to reach my friend’s office and get rid of that book. As far as I know he never had to explain it to the entire Quorum of the Twelve, but he did give it to President Packer to examine. President Packer spent a few minutes with it and I was told really didn’t have much to say; sort of an “Oh well.” The thing that kept saving me with various people was that the book was so positive and faith-promoting that they were unable to find fault with it. I speculate that was the case with President Packer. A smaller run of a very fine leather edition was issued along with the regular hardback. After some thoughtful consideration, it was decided that a signed copy be sent to President Gordon B. Hinckley as a courtesy. I soon received in reply a thoughtful but short and generic form letter thanking me for the gift; the First Presidency has a policy not to endorse books written by members of the Church. Soon after, as I sat at my desk in the Church Office Building, I got a call from a secretary in President Hinckley’s office. She asked if I was the Dennis Horne that had written the book about Elder McConkie. I replied that I was and my heart skipped another beat or two and I began to sweat. She told me that President Hinckley’s personal executive secretary wanted to speak with me. I thought I was really in trouble now. The secretary came on the line and, to my relief and delight, simply asked if he could buy two more copies of the leather edition. I assured him that I could arrange to make that happen. I naturally but incorrectly assumed the two extra copies would be for Presidents Monson and Faust, President Hinckley’s counselors. A few days later I found myself seated in the secretary’s office, which was just outside President Hinckley’s office. I could hear the prophet’s voice floating through the open doorway of his office as I sat there. The secretary told me he wanted to purchase one for the office library and one for himself, which disabused me of my previous faulty deduction. I was still happy to oblige. Some weeks later I ran into this same secretary on an elevator and worked up enough courage to ask him if he knew if President Hinckley had done anything with my book. He observed that President Hinckley had kept the biography on his desk for a few weeks and had been reading it during spare moments between meetings and phone calls. Needless to say, this knowledge was highly gratifying. At the next (April 2001) General Conference, in his remarks, President Hinckley said to the entire church: “Thank you for all that you do for me, for the letters you send, for flowers and books and various expressions of your thoughtfulness and love.” While I knew that he received books in the mail most every day, I still felt he was speaking partially to me. Yet I was still concerned with a few rumors that reached my ears, evidently originating with certain of Bruce’s children and/or with a church archives employee, that Brother Packer was mad at me and my book and this concerned me. Then one day, perhaps a year or so after the book appeared, as I was walking down a hallway in the Administration Building, I ran into Elder Packer. I mentally planned to scoot past and say nothing, but he saw me and struck up a conversation, asking me my name. I told him, but perceived no glimmer of recognition. Because I wanted to know what he thought of me enough to press the matter further, I then took fresh courage and said clearly to him: “You might remember that I am the fellow who wrote the biography of Elder McConkie.” After a moment of hesitation, he simply replied, “vaguely, vaguely,” without much reaction. By then we had reached the end of the hall and we parted ways. From this experience I felt confident that he was not harboring any great dislike of me or my book. As if to reinforce that conclusion, a week or two later he saw me again, came over to where I was, made a cute little joke, and walked off with a smile and a chuckle. He was holding no ill will toward me and I was again comforted. (The Church lost a mighty Seer when he passed away last year.) I crossed his path a few more times over the next year or two and he never brought the subject up or said anything to me. In the years that followed, I had members of the extended McConkie family buy many books through me or from bookstores and I received compliments from several of them. It seems all of them (that communicated with me) read it and enjoyed it; they were sweet and kind and generous people that I thought highly of. Brit McConkie, the next youngest brother after Bruce, especially was one of my favorite people. He was a spiritual giant and friend and mentor. On one occasion not long after the book came out, he inquired of me how it was selling at Deseret Book. I told him their first smaller order had quickly sold out and they were slow in ordering more, so it could have been doing far better with them that it was. He called them “stupes” (the harshest word I ever heard him use) and did a little complaining at their treatment of the book. He also told me that he had received a call from Joseph McConkie’s wife about some matter, who also asked him about me. He had explained that I really was a nice guy, that he had known me for many years, and had given me my patriarchal blessing. One of the sweet spiritual experiences of my life was a time when Brit took an hour and told me stories about the faith of his father, Oscar W. McConkie, and his gift of healing. Once while I was visiting with the publisher in his bookstore, a customer also present mentioned that he had not long before asked Joseph McConkie what he thought of the “Horne” biography of his father. His response was something like, “We are very disappointed in that young man.” Such a reaction was to be expected and I came to view occasional reports like that with resignation and even a little humor. Another time a director of a certain Church Department noticed a copy of my book on his secretary’s desk, found out I had written it, and wanted to talk to me. He came to my desk and the first thing out of his mouth was something about being shocked that I was so young (I was about 33 then) and secondly that I had pulled it off; then he wanted to buy his own copy. I got the same reaction from a Human Resources manager who noticed the book on my desk, was shocked that it even existed, mentioned he had been a roommate of one of Bruce’s son’s decades before at BYU, and insisted that I had pretty much worked a miracle to produce it. He didn’t know the half of it. Then he bought one from me, still amazed. During these same months, Elder Glen L. Rudd walked past my desk, saw the book, and instantly wanted to know about it and me. He was a sweet, kind, and wonderful man that had been great friends with Bruce. We were soon deep in conversation, talking about our mutual admiration for Elder McConkie and telling stories. That become the beginning of a wonderful friendship, with many visits and talks, and Elder Rudd signing for me the book on the church welfare program that he wrote and I signing for him copies of all seven of the books I eventually wrote. To this day he insists on my signing for him every new book I write, including the latest biographies on President Lorenzo Snow and Elder Orson F. Whitney. Needless to say, he was also surprised at what I had accomplished. Elder Joseph Murren, another former general authority (now deceased), evinced a similar reaction. He mentioned that he had been one of Joseph McConkie’s general authority supervisors when McConkie was a mission president in Scotland, and he thought he guessed what kind of a time I might have had getting that book written and published. And he wanted a copy for himself. Both Elders Rudd and Murren bought multiple copies from me to give to associates, family and friends. I later learned that Joseph McConkie began writing his own biography of his father at the very time mine became available. I could sympathize with him—what was he to say every time someone asked what he thought of the “Horne” biography of his dad? I surmise that in his mind it was better to direct people’s attention to a book of his own than criticize mine—despite the request from his father not to write one. So I take credit for basically forcing Joseph to write a biography of his father and he did really good work. I also heard a grapevine report that Joseph had read and liked my second book, “Called of God, by Prophecy” that I sent him as a sort of peace offering. I hope that was true. Around 2008-09 I decided it was time to push for issuance of a second edition containing much of the material I had removed from the first edition, and also adding some new material I had discovered in the intervening years. I therefore wrote a very long “Epilogue” containing this material and after some more troubles (who’d have thought? ), the second enlarged edition was published by Eborn Books in 2010. Because we had neglected to keep an electronic file of the first edition, or had lost it, we had to have the book scanned and put the new material in the back. The scanning process messed up the quality of the photos, which was sad and not known until it was too late to fix the problem. However, the second edition Epilogue contains much of great interest to Bruce R. McConkie fans. In his own biography of his father, The Bruce R. McConkie Story: Reflections of a Son (a book long out of print that is now hard to locate and expensive), Joseph Fielding McConkie shared some of his own troubles with becoming a new author: “Then the idea came that I could write a biography of my grandfather Joseph Fielding Smith, who was then president of the Church. That was a little audacious for a kid my age, but I went back to the publisher with the idea, and they were excited about it. So I wrote a book on the life of President Smith, which sold very well and opened the door for me to write other things” (250). Sounds like a similar search for an “angle” or opening, like mine, trying to get a start, doesn’t it? But he didn’t have to endure anything near what I did. Before he died in October of 2013, earlier that same year in April, Joseph McConkie gave a very fine review of his father’s life and work and special witness at a Church History Department-sponsored fireside-type gathering in the Assembly Hall on Temple Square. The place was packed with mostly elderly people (I felt young again) who were friends and relatives of the McConkie family, as well as many other interested people. I decided to attend because of my love for all things about Elder McConkie. My wife and I happened to sit on the second row, right behind Bruce’s sister, Margaret Pope. Joseph gave a superb talk about his dad. He did not happen to notice me, which was probably just as well. The really interesting portion of the evening was after his formal presentation. It was in answering questions from the audience that he gave listeners a better idea of what Bruce McConkie was really like as a father and regular good person of integrity and character, but not infallibility. I recollect that as I did the comprehensive research for my biography, and happened to mention to various parties the subject that I was researching, I was sometimes treated almost like a de-facto member of the McConkie family. Often people would want to tell me stories about Bruce, at times positive or glowing, other times with a slightly negative slant. Some were obviously inaccurate or embellished. A few were critical. I did not care for those particular stories. Joseph McConkie wrote: “Criticism followed Bruce McConkie like a shadow. He expected and measured himself by it. ‘The measure of a man,’ he explained to his children, ‘is not found in who speaks well of him but who speaks against him. It is just as important to have the right enemies as it is to have the right friends’” (265). I have found this insight to be true. Having always tried to do my best as an author to reflect the counsel and teachings of Church authorities, especially when handling difficult or complex subjects, I myself have attracted some critics, mostly of strong liberal bias. One online critic especially has seemed to make a point of taking occasional potshots when another one of my books has come out and is being discussed. On one occasion, after having noticed another misinformed jab, both at myself and toward something (unforgivably orthodox) I had quoted from Elder McConkie, I realized that this fellow was of the same ilk as those that followed Bruce with criticism while he lived and taught the uncompromising scriptural doctrine he did and bore the powerful witness that he had. A feeling of brotherhood and unity with Elder McConkie came over me, as I absorbed the fact that I now had the same kind of enemies he did and was taking the same criticisms he had. I felt quietly comforted; almost elated at this realization. I was humbly grateful to be figuratively standing in line behind Elder McConkie, becoming part of his caravan; following where he had lead. Such is my story: a journey through a fiery furnace of obstacles and trials but with ultimate success. No university course could have ever taught me what I learned in the school of real world experience. I was immeasurably enriched by my study of Elder McConkie’s life and by reading every talk he ever gave and much in his books. I learned how to write, rewrite, copyedit and proofread. I learned the publishing business. And I learned that Elder McConkie was indeed an Apostle, a special witness of the Lord Jesus Christ. A fascinating account of the treacherous terrain around writing biographically about a living or recently living person, with all the various family (and, in this case, institutional)sensitivities involved, even when, as in your case, the intentions are respectful. You seem to have taken quite a beating, while still maintaining a constructive attitude, rather remarkable. Thanks and well said, especially coming from someone who has been there and done that and knows the complexities of such writing. A fascinating look at the path you had to take to get this book into print! Having self-published a couple of memoirs by my own family, I have to say that compared to your thorny path, mine was like slipping down an oiled slide! And here I thought I had done some hard work! 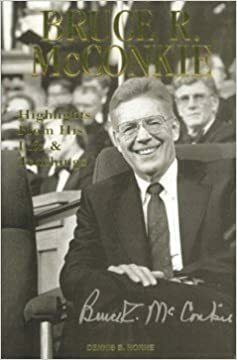 A question about this book: I had not previously heard of your bio of Elder McConkie, and now that I have discovered it, I am interested, but I can't find it! It's not available in any form (except for used copies of the leatherbound edition) on Amazon, and I can't find it even on Eborn's website. I was hoping for the Kindle edition, but that appears not to be available either. You can respond via email if you wish: cyberherbalist@gmail.com. Thanks!